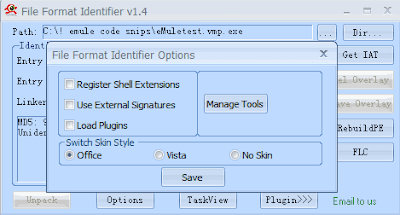 It is an auxiliary tool for virus analysis, which includes various file format recognition engine code, sniffing packers, unpacking by virtual machine, editing PE file, rebuilding PE file, obtaining the import table(using virtual machine to decode the encode import table), dumping memory, processing the overlay, PE address conversion, supporting PEid plugins, computing MD5 and efficient use of third-party tools, and so on. It is also used for disposing the Trojan virus samples during virus analysis. This software is free; you can download, install, copy and distribute it non commercially; For commercial sale, copy and distribute, you should get the warranty and permission of DSWLAB before (for example, if the anti-virus company want to use it to analysis the Trojan horse in batches, he must get mandate and permission of DSWLAB before). Supporting file drag, directory drag, you can also install shell extensions to recognize file and directory. In order to recognize more packers, you can use the external signatures library (must named userdb.txt, the library format is as same as the PEid's external signatures library). Note: A '*' will appear if this packers was sniffed by the external signatures. You can unpack the packer if the "unpack" button can hit. The function based on the technology of virtual machine it could unpack various known & unknown packers. It is suitable for unpacking the protected Trojan horse in virus analysis and because all codes are run under the virtual machine so they will not take any danger to your system. Hit the button after "PE Section", you can edit the information of the sections. Hit the SubSystem button can get the detailed PE information, you can editor them. You can hit "Del Overlay" button to delete the overlay if the PE file has overlay, you also can hit "Save Overlay" button to save the overlay. Hit Options button to set using PEid plugins, without restart FFI, the PEid plugins must be put the directory named plugins, and then Hit Plugin >>> to use PEid plugins. This function is primarily used for repairing the PE file which was dumped from unpacking. Hit Manage Tools button after Hitting Options button, you can add / remove IDA / OllyDBG and other third-party tools to shell extensions, than you can activate the third-party tools in the FFI to open the target file directly. Note: After add the third-party tools, you can hit Pulig>>> button to get their information, click them you can use the third-party to open the target file. Hit TaskView button then you can terminate the process and dump the memory with three mode(Dump Full Dump Partial and Dump Region), and you can also correct the image size of the module. After hitting the Get IAT button, getting the import table after choose the process, input the right OEP information before hitting DumpFixer button. If any undistinguished API appears, you can set virtual machine decode steps, and decode this item by hitting VM Decode menu. If there is any information which you do not want, hit Del Thunk menu or Cut Thunk menu to delete it. If you want to get the import table for the non-main module of the process, please use right button in Manipulation records frame, and hitting Load this module menu, that is the module's import table obtained in this way. Supercop Kill various kinds of Trojan horse completely, protect the security of system in an all-round way.